White walls. Downsized furniture. Unadorned surfaces. Style tips like these make decorating small spaces a bore. The following seven homes break every guideline in the less-is-more ​rulebook. 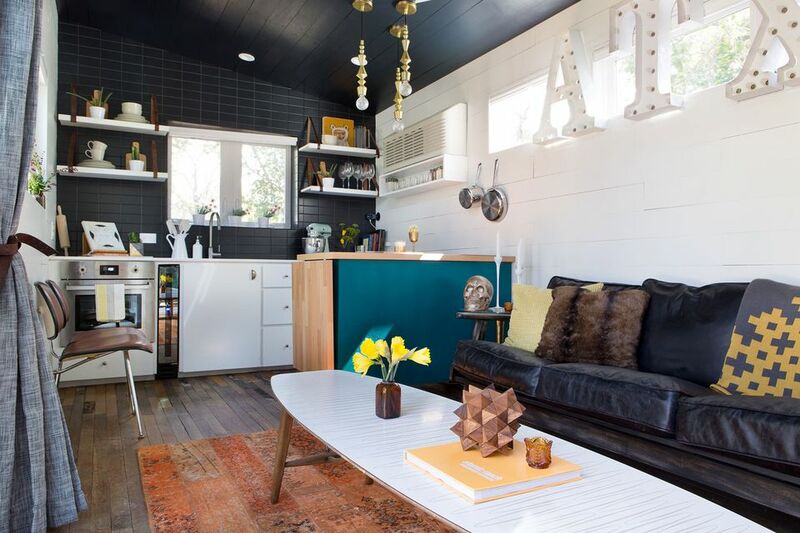 Each micro space proves when done right, you don't need a lot of square footage to create a home that's brimming with style. Sometimes a single piece of bulky furniture will add a lot of appeal to a small space. Stuffing the tiny nook shown here with several pieces of small-scale furnishings would make it feel cramped and crowded. However, filling most of this space with a large sectional sofa makes this compact living room very inviting. French blogger Éléonore Bridge transformed her 377 square foot crash pad into a stylish home by embracing a more-is-more décor theme. How did she pull this look together? Walls and furniture in soft shades set the stage for her colorful wall art, curios, and home accessories. Dark ceilings can add depth to a small bright space with white walls. The trick to making this work is using a satin or semi-gloss paint that reflects light. Unlike a flat dark color, one with a sheen will keep your space feeling bright. When done right, rugs can create different zones in a small room. This 100 square foot space uses a large rug to establish the living room, and a smaller one to carve out the home office. Dark walls can add architectural interest to a small space when paired with features in a contrasting light shade. This stylish kitchen offsets dramatic black walls with a white ceiling and cabinetry. White paint creates the illusion of molding around the door's edges and the top of the walls. A matching dining set does look pulled together. But if you want to make a bold, stylish statement, a mismatched set like the one shown here has a big wow factor. To pull off this look, you'll need to make sure that the chairs you pick are the correct seating height for the table you're using. To create a bohemian vibe, use an eclectic mix of seats as shown here. For a clean, and contemporary look, keep all the chairs the same style, with each one being a different color. Recessed ceiling light fixtures enhance small spaces without taking up precious floor or vertical space. However, layering your lighting will let you add brightness and style where you want it. As shown here, an oversized pendant shade gives this tiny living room a beautiful focal point while illuminating the coffee table. The floor lamp on the right is for reading. The two small table lamps in the middle provide this tiny room with a diffused decorative light.